Home > Car Care > When should tires be replaced? Tires make a huge difference in the way the vehicle handles. Worn out tires have less grip in turns and on wet surface, which means the vehicle is more likely to slide or hydroplane in a rain. The braking distance increases too. The all-wheel drive and vehicle stability control system become less effective when tires are bald. New vs. the completely worn-out tire. The tire on the right is unsafe. How to know when it's time to look for new tires? The tire tread depth is measured in 32nds of an inch. New tires have from 9/32" to 11/32" of the tread material. 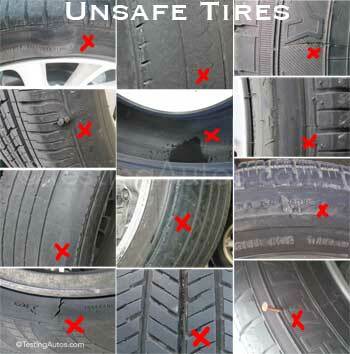 A tire is considered unsafe when the tread is worn down to 2/32" (1.5 mm). For example, the tire of the red car in the photo above is worn down beyond the safe limit. Should you wait until your tires become unsafe or replace them earlier? In our experience, you will start noticing slipping on wet or slick roads when your tires are worn down to about 4/32" (3.2 mm). it's at this point you should start looking for new tires. The tire on the right is worn down to 4/32" of an inch. This will give you some time to shop around and compare ratings and reviews for different tires. For winter tires, change them even earlier. At 4/32" of the tread remaining, winter tires are pretty much useless in snowy or icy conditions. When you take your car for an oil change, the mechanic working on your car will check your tires and measures the tire tread depth. You can usually see it marked on the vehicle inspection report. We recommend taking your car to a reputable auto repair shop or dealer. It's easier to check tires, brakes and other components important for safety, when your car is lifted on the hoist as opposed to a drive-through oil change service. 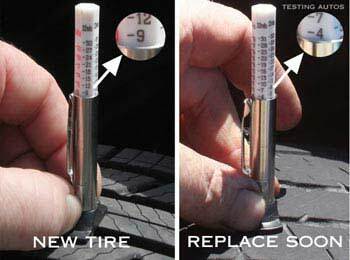 The same tires from the photo above, measured with the tire tread depth gauge. First, let's see how to measure the tread depth with the proper gauge. We purchased this tire tread depth gauge for $5 in Walmart. Hold the gauge over one of the major grooves, with the foot of the gauge placed across the groove. Slightly push the scale down. Measure the area that appear to be worn out the most. 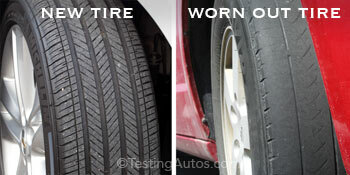 See the photo; these are the same two tires as in the photo above. The new tire shows 9/32", while the tire on the right photo shows 4/32". Same tires measured with the Washington quarter. If the tire gauge is not available, the Washington quarter can help. With the quarter placed upside down inside one of the major grooves, look at the George Washington's head. If the head is covered by the tread, you have more than 4/32" of tread material left. If the top of the head is even with the remaining tread surface, as in the right image, you have about 4/32" of the tread material left. The tire tread wear indicator bar is almost flush with the remaining tread. This tire needs to be replaced soon. Many tires also have tread wear indicators. 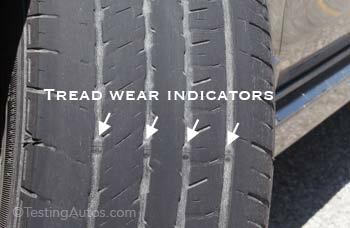 Tread wear indicators are the rubber bars built into the tread across the main grooves. As the tire wears out, tread wear indicators become clearly visible. In a new tire, you barely can see them inside the grooves. See the photo, this tire is worn down to 4/32 of an inch. 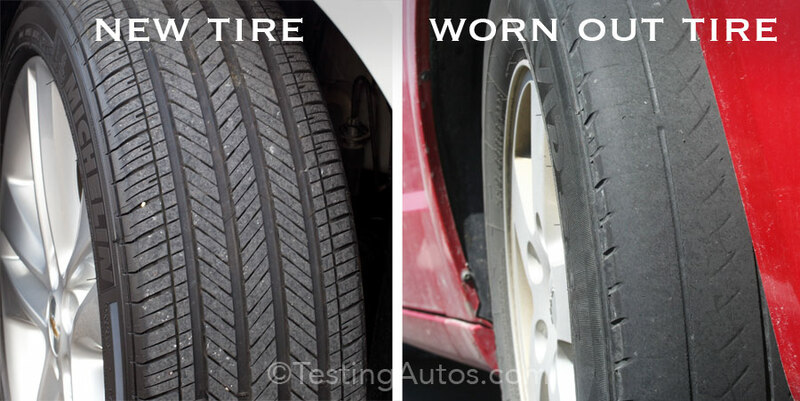 Worn out tread material is not the only reason for tire replacement. A tire needs to be replaced if it has cracks, cuts, bulges, punctures in the sidewall or any other damage or defect that makes it unsafe. 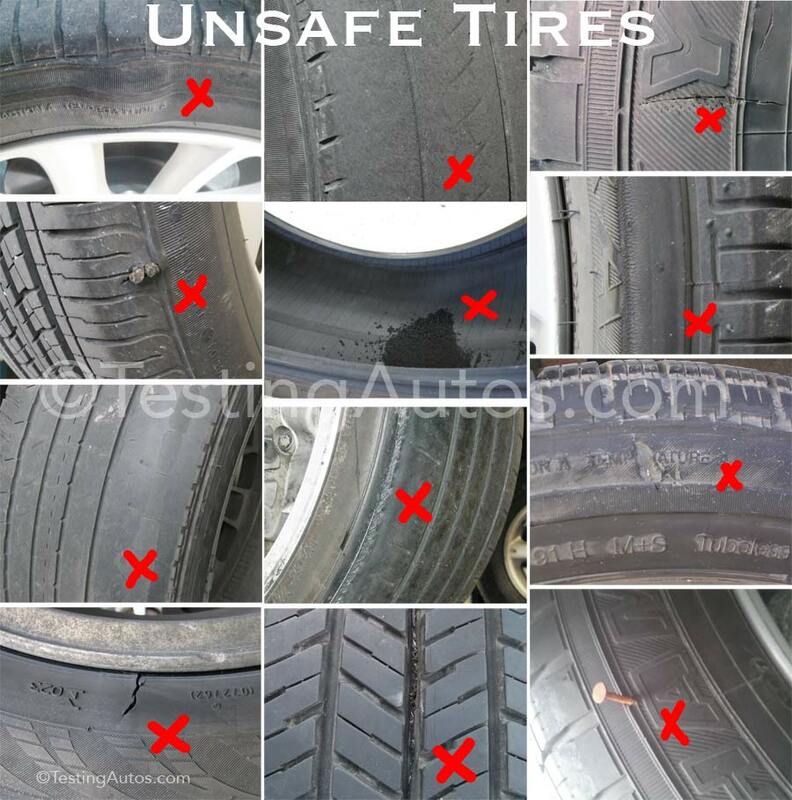 Examples of tires that need to be replaced. 2. Tread completely worn out. 3. Cut in the sidewall. 4. Puncture in the sidewall (sidewall puncture cannot be repaired). 5. Tire that has sidewall damage after being driven flat. 7. Damage to the sidewall. 10. Tire worn on one side. Do tires need to be replaced because of the age? The first two digits indicate the week, the last two digits show the year. 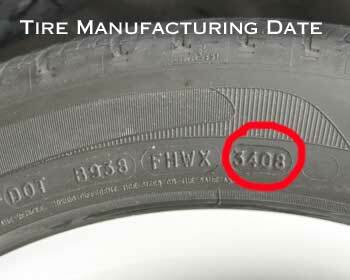 This tire was produced in August of 2008. Yes, even if the tread is in good condition, the tire material degrades over time. The NHTSA recommends replacing tires that are more than 6-10 years old, regardless of the wear. How can you tell how old is the tire? Check the DOT Tire Identification Number. 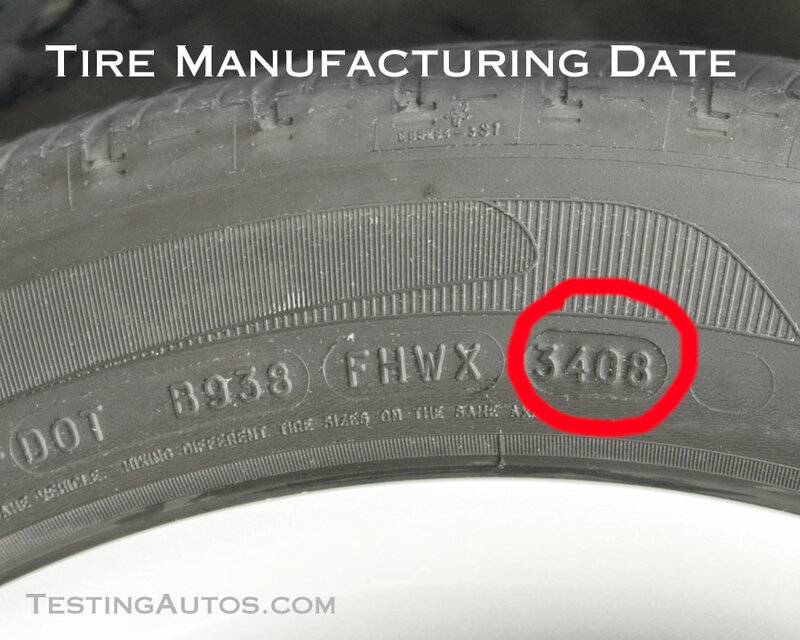 On the tires produced after the year 2000, the last four digits of the Tire Identification Number indicate the week and the year the tire was manufactured. For example, the tire in this photo was produced on the 34-th week (August) of 2008. 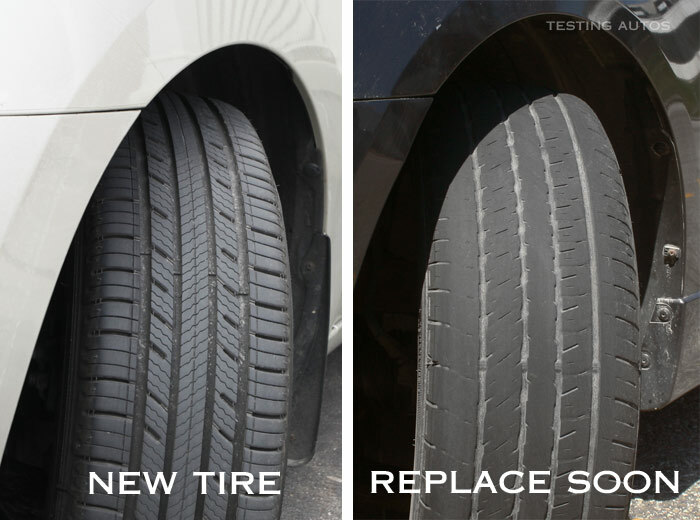 Do you have to replace tires with the same brand that was originally installed on your vehicle? No, you can opt for any tires that fall within car manufacturer specifications (size, speed rating, etc.). In fact, by switching to different tires you can adjust your vehicle's handling to your preferences. If you enjoy spirited driving, you may want to switch to tires with better handling characteristics. If you like a quieter ride, you can select tires that provide better ride comfort. For example, one of our colleagues was looking to replace the original tires on his Mazda 3. His original tires were worn out and noisy. He switched to Michelin Defender tires that resulted in a much quieter ride. Sites like tirerack.com and consumerreports.org offer comparisons of different tires on tread life, fuel economy, ride comfort, noise level, handling in snow and other ratings. If you are looking for better fuel economy, look for low rolling resistance tires. If you need more grip on wet roads, look for wet traction or wet braking scores. 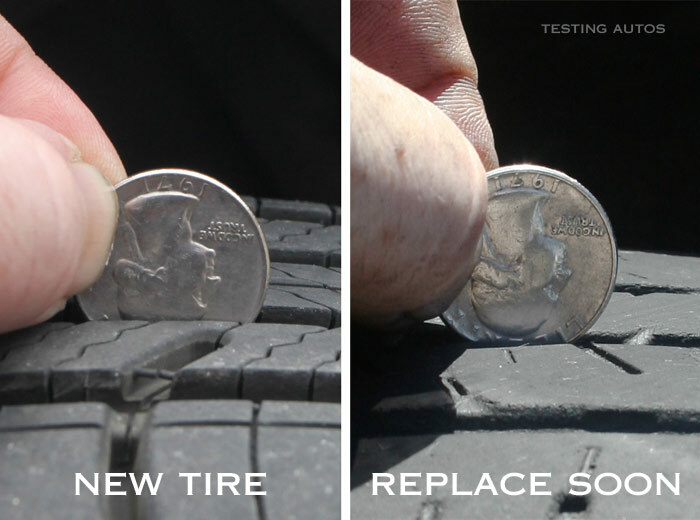 Replacing all four tires is not cheap, but it's an investment in your safety and better driving experience. How long do tires really last? We came across tires that are completely worn out at 20,000 miles. Just recently we spoke to a young driver whose front tires were almost done at his first oil change at 5,000 miles. Of course, it was a front-wheel drive sporty car with a powerful turbocharged engine. We have also seen tires lasting for over 60,000 miles. It depends on the car, tire quality, size, driving habits, regular tire rotations and other factors. Why do tires need to be rotated? Without regular tire rotations, in a front- or all-wheel drive vehicle, front tires wear out faster. Tires are rotated between front and rear axle to even up the tire wear. Most cars on the road today have a front-wheel drive. Many car-based all-wheel drive SUVs and crossovers are also built on the front-wheel drive platform. The heavier components of the vehicle, such as the engine, transmission and the battery are placed in the front. As a result, front tires wear faster than the rear tires. For example, see the photo above. This car came from a car rental company. It has only 20K miles, but without regular tire rotations its front tires are worn out, while the rear tires still have plenty of the tread material left. 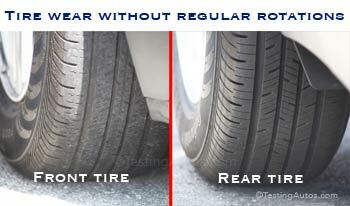 which often causes the rear tires to wear more on the inside. In some cars, rear tires may wear unevenly if not rotated. For example, look at the tire in this photo. It's "cupped". 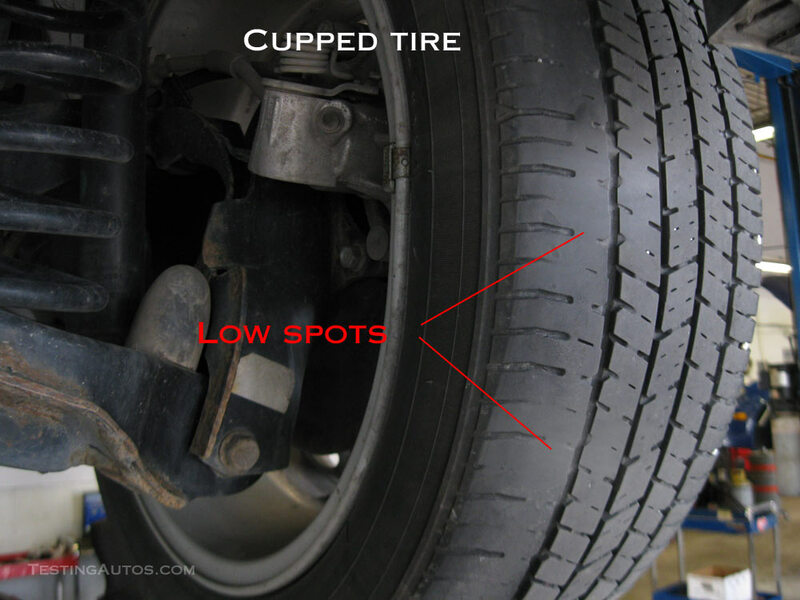 Cupping is the wear pattern where the tread material wears unevenly, with alternating low and high spots. What can you do to make your tires last longer? It's actually easy: opt for tires with a better tread life rating. Keep the tire pressure up to the specs and have the tire rotation done regularly. In some cars, if not rotated, tires may need replacement in as early as 15,000 miles. If you notice that the steering wheel is off center when driving straight or the vehicle pulls to one side when driving on a level road, have the wheel alignment checked and adjusted. It's also a good idea to do the wheel alignment when installing new tires.